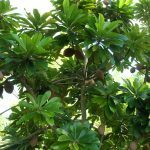 Tropical Fruit – A Tasty Survey, Part III - Richard Lyons Nursery, Inc. 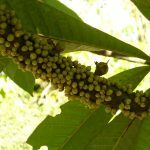 This week’s installment on tropical fruit species deals with a subject which has been addressed in this space before—the confusion that can occur from relying on common names. What happens often is that a single species may have multiple common names, and that condition can develop even in a relatively small geographic area, particularly where mountains or forests historically have limited access by one human population to another. More rarely, unrelated species have been accorded common names that are so similar that bewilderment reigns. 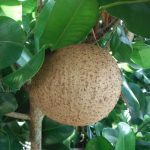 Such is the case with what we call mamey / mammee / mamee sapote / mamey sapote / zapote mamey / mammee apple / mamey amarillo / mamey colorado / zapote rojo / mamey sapote / zapote grande / mamey de Cartagena / zapote de Santo Domingo. These common names—and many more—are found around the Americas, but, perhaps surprisingly, they are attached to just two species. Both are fruit trees, but that is where the similarity ends, because they are members of distinctly different families. Let’s try to slog through the Swamp of Confusion and come out the other end with our wits intact. The tree known as sapote/zapote in Colombia is Mammea americana, of the family Calophyllaceae. 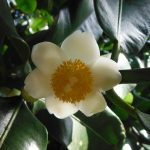 It bears a resemblance to its well-known relative in the southern U.S., Magnolia grandiflora. Capable of reaching a height of 59-69 ft. in its native range, M. americana bears dark green, glossy, leathery leaves measuring about 4 X 8 in. and fragrant white flowers. Its fruit has a hard, roundish, brown rind about 4-8 in. in diameter. The edible flesh of the fruit, colored orange or yellow, is wrapped in a dry, white membrane that should be peeled away. The fruit is always fiberless, but its texture varies in softness and juiciness. Native to South America, M. americana is now cultivated as far away as western Africa and Hawaii. Its gateway to southern Florida was probably the Bahamas. Though the tree prefers deep, rich soils, it has proven adaptable to our limestone soils. Various parts of M. americana are reputed to have medicinal qualities, as well as the capacity to kill or repel a number of insect pests. Among the many common names applied to this species are mammee, zapote mamey, mammee apple, mamey amarillo (yellow mamey), mamey de Cartagena, and zapote de Santo Domingo. 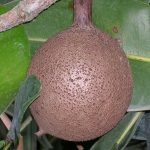 The tree known as sapote/zapote in Cuba is Pouteria sapota, of the family Sapotaceae. It is native to Mexico, Central America, and Cuba, but began to be carried to other New World sites hundreds of years ago. Distribution was probably slowed because the seeds of P. sapota have short viability. As far as can be determined, P. sapota was introduced into Florida in the mid-1880s. The fruit is now quite popular in southern Florida, Mexico, Central America, and the Caribbean. It is not well-known outside those places, but there is some evidence that interest is developing in various Old World countries. P. sapota possesses a stout trunk and a small number of large scaffold branches that support a spreading crown. While capable of reaching more than 140 ft. in its native range, this species tops out at about 40 ft. in southern Florida. It produces leaves as large as 4 X 8 in. Leaf undersides are light green or brown, and are fuzzy when young. Its small white flowers tend to cluster at the ends of small branches. The thick, woody fruit of P. sapota, covered by a reddish-brown skin, is elongated, measuring as much as 3 X 8 in. The flesh of the fruit, smooth and usually fiberless, varies in color in a range from dark red through salmon pink and features a distinctive, sweet, almond-like flavor. In addition to being good to eat out of hand, P. sapota is frequently used to flavor ice cream, milkshakes or jellies. There are lots of cultivars of P. sapota in southern Florida. IFAS reports that the cultivars ‘Pantin’ and ‘Magana’ account for close to 100% of the sapotes grown commercially in the state. Fruiting periods vary greatly among the cultivars, so it’s possible by careful selection to have trees in fruit year-round; and these trees fruit prolifically. P. sapota does have one important similarity to M. americana: It tolerates a large range of soils, so long as they are well-drained. It is particularly important with P. sapota to avoid buying a rootbound specimen. 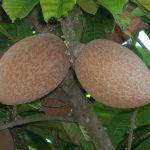 Among the many common names applied to this species are mamey, mamee sapote, mamey sapote, mamey colorado (red mamey), zapote rojo (red sapote), and zapote grande. Richard Lyons Nursery carries M. americana and P. sapota in various sizes.